On a broader aspect, not all start-ups survive long. Some of them lack in planning the right structure of business while most of them collapse due to irregular fund sources. In spite of several schemes and initiatives by the government, in the last two years, about 40% start-ups shut their shops while about 75% of them didn’t ever try again. As MSME, the start-ups can now avail the benefit of credit facilities, subsidies and tax exemption schemes offered by the government for MSMEs. Recognizing the growth prospects of MSMEs, banks have placed several fundraising schemes for MSME entities. Like one stated as Priority Sector lending, where banks recognize the revenue model of business and sanction them loans at subsidized rates. Also, preferential treatment is given to these entities in case of any delays in repayment. Startup entities registered under the MSMED Act are offered special assistance and treatment from the State government in terms of tax/tariff subsidies, electricity exemptions, capital investments, state licenses and easy approvals in fund applications from regulatory institutions. Entities recognized through MSMED act are furthermore assisted and motivated by credit options, tax exemptions and new policy schemes issued by central government. Schemes and institutions like NSIC, SIDBI, CGTMSE, etc guided by Central government, on recognition of eligibility of MSMEs issues easy collateral-free loans, loans for their modernization & expansion goals and provide ease in the hiring of advanced technology. Single Point Registration Scheme (SPRS): Exemption from payment of Earnest Money Deposit (EMD) and fund less issue of tenders. Credit Guarantee Scheme (CGS): Providing guarantee of credit assistance from CGTMSE fund set up by SIDBI for entities engaged in manufacturing and service activities. Coir Udyami Yojana: Supporting Coir Units with credit up to 25% of project cost up to a maximum of Rs 10 lakh and financing working capital with up to 25% of project cost. Market Development Assistance: Aiding startups get access to international markets and ease exports of their goods and services through government agencies. Credit Linked Capital Subsidy for Technology Upgradation: Supporting startups providing access to technology providing upfront capital. Raw Material Assistance (by NSIC): Providing easy access to finance for processing raw material for production and help startups focuses more on their concerned services. Infrastructure Development Scheme: Providing access to software parks, lease spaces, finance and assistance in holding exhibitions in metro cities and capturing the market. Revamped Scheme of Fund for Regeneration of Traditional Industries (SFURTI): Helping startups inclusive of traditional industries and artisans to organize and get long term sustainability, providing easy access to tools & equipment, strengthen the cluster with market intelligence, improved technology, etc. Start-up MSME Registration – How to Apply? Start-ups too can get themselves recognized as an MSME, on an application of Udyog Aadhaar Memorandum (UAM) and filing in necessary declarations & documents. While the complete process for MSME registration has been provided for you here. Note: Start-ups compiling to eligibility of MSME registration, can only be registered. 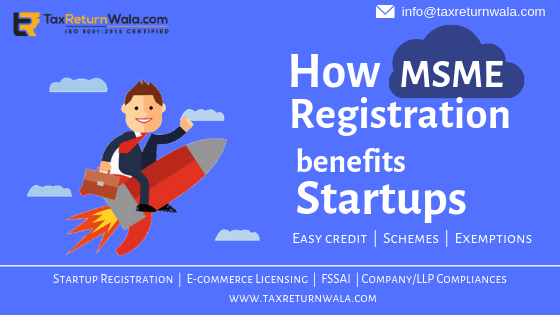 We at TaxReturnWala brings you constant updates on the latest policy schemes and benefits offered by the government for MSMEs and Startups. We help you choose the right business model for your business and help you get your business on government records online.